Web content management (WCM) isn’t new. But customer demands and expectations are changing. That’s why finding the right WCM solution that supports delivering better digital experiences is important. 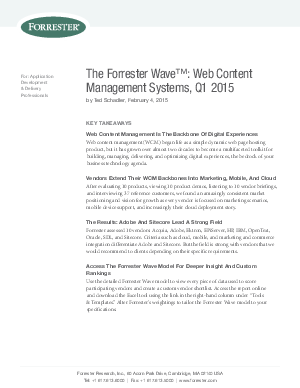 Forrester Research, Inc. evaluates 10 vendors and names Adobe a Leader in The Forrester Wave™: Web Content Management Systems, Q1 2015. Again.